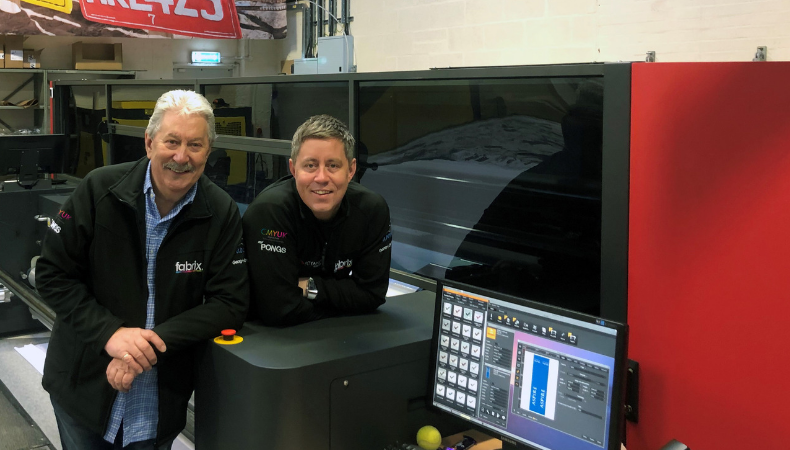 Colour Graphics sees multiple immediate benefits after purchase of CMYUK’s FabriVu 340 digital fabric printer including flexibility, speed and range. Colour Graphics, a home-based curtain making business has seen a substantial transformation with a yearly turnover of £1.5 million. Recently, the company has invested in a FabriVu 340 with Klieverik calendar which was purchased from CMYUK. The 3.4m-wide FabriVu replaces an older Mtex 5032 Pro and Colour Graphics has experienced immediate advantages in flexibility, speed and range. The FabriVu 340 digital fabric printer can print at speeds of up to 500sqm/hr and a resolution of 2,400dpi. The printer can handle various fabrics and paper which makes it more appealing for businesses of all sizes and highly competitive value for money. The Klieverik calendar can be utilised for dye-sublimation transfer printing (paper to textile) and for dye fixation of direct printed dispersed dyes or pigments. Now, Colour Graphics offers their own range of aluminium TFS profiles for building wallmount, freestanding and lightbox tension fabric frames in-house with rapid turnaround times. Thanks to the FabriVu, Colour Graphics have become a reliable one-stop shop for trade TFS fabric exhibition and display systems.